Las Vegas airport is officially known as the McCarran International Airport. This Airport is the gateway to the most visited cities of the world. Being an international airport, Las Vegas Airport is fully modernized and equipped with the latest facilities. Having two terminals and operated by airline providers like Allegiant Air, American Airlines, Spirit Airlines, Thomas Cook Airlines and US Airways, Las Vegas airport is ranked high on passenger traffic. Las Vegas Airport was established in the year 1942 as the Alamo Airport but was later named as McCarran International Airport on December 20, 1948. A gradual expansion plan was needed as the Las Vegas city was fast turning into a major tourist destination. Therefore lead to series of renovations of the Las Vegas Airport to give it the present form. The revamping of Las Vegas Airport has added lot of new facilities like the baggage-tracking system, SpeedCheck kiosks, ATM and many more modern facilities making it a comfortable transit point. Another remarkable facility that was introduced in Las Vegas airport was the Consolidated Rent-a-Car facility. This facility makes transportation at the Airport so much easier that tourists no longer have to undergo the trouble of waiting for the public transport system. All they have to do is hire a car and travel along. 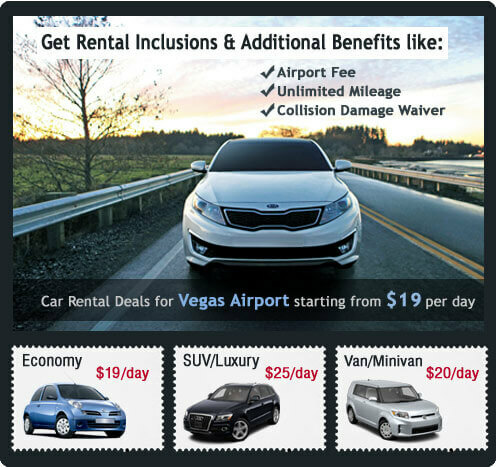 Why Choose Vegas Airport Car Rental? Traveling the Las Vegas city can be much more informative and explorative if tourists go for a car hire from Vegas Airport Car Rental. Discovering a place like Las Vegas with a comfort of a car, rented from Vegas Airport Car Rental can be a unique experience. Also the well maintained cars provided at adequate rent, make Vegas Airport Car Rental an excellent car hire agency. Therefore in order to make your journey a pleasurable and fun filled affair in Las Vegas city, go for a car hire from Vegas Airport Car Rental.